This novel by physicist Thomas A. Cahill applies science in describing environmental devastation that is threatening existence on the fictional planet Kraal. For more than a century, the robotic space probe from Kraal had anticipated this moment. It was now well within the solar system of the target planet. The sun that warmed the planet was in position to allow the extended atmosphere to slow the probe so it could be captured. If the course of the probe were too far from the sun, it would escape the solar system and become lost in interstellar space. If it passed too close to the sun, the heat load could exceed design limits and the probe would burn up. But the trajectory was nearly perfect and, after an extended set of maneuvers, the probe was finally captured into the gravitational well of the third planet. Now came the important step as the interstellar probe released the miniature science probe, Bioprobe 7, to enter the atmosphere and attempt to gather biological data on one of the dominant species. This data, sent back to Kraal on a tight laser link, would be used to clone an example for their interstellar zoo, using the ever more efficient growth tanks of Bio-Ops, the biological arm of the government of Kraal. While the probe had intercepted all sorts of radio transmissions, the mixture of pictures and words in television was especially valuable. From these pictures, Bioprobe 7 received a strange and disturbing set of impressions of the life on Earth, as the planet called itself. The dominant species appeared to be a carnivorous predator, and television images were filled with violence and death, interspersed with beauty and culture of a primitive kind. The logic circuits of Bioprobe 7 were not designed to judge values, but everything in its memory seemed to indicate that the inhabitants of this planet were a vile lot. So begins Greenhouse Redemption of the Planet Kraal, the fourth and newest novel of science and fiction by renowned physicist Thomas A. Cahill. The book describes how an advanced civilization 6.2 light years from Earth succeeded in cloning a human for their planet's cosmic zoo. Cahill asserts that "Everything in this tale could happen. Many things in this tale will happen. Some things in this tale have happened." That contention correlates with the recent announcement that real-life astronomers at a massive observatory in Chile have discovered signs of a potentially life-bearing planet 6.6 light-years from Earth — so close that Earth-based television transmissions broadcast in 2006 are now arriving there. In Cahill's novel, the probe that the inhabitants of Kraal landed on Earth extracted DNA from a human subject and transmitted his genetic data to Kraal for cloning. Kraal's unscrupulous ruling elite masterminded the mission of duplicating a human as a way to distract Kraal's citizens from a looming ecological disaster that their mismanagement of Kraal's natural resources had provoked. The resulting runaway greenhouse effect already had devastated most of their world. The captors, however, underestimated the mettle of the human spirit, leading to revelation of the dark secret about the looming planetary disaster. 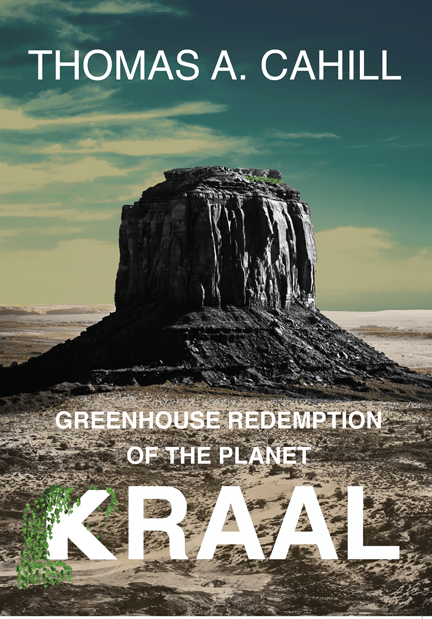 Kraal's attempts to recover something of its past ecology becomes a challenge to Earth, which is staggering closer to a tipping point in its own impending greenhouse climate collapse. While Greenhouse Redemption of the Planet Kraal is a work of fiction, it is based upon solid science, as are all of Cahill's novels. Thomas A. Cahill meticulously researched the likelihood of events described in the book. He is a professor of physics at the University of California, Davis. 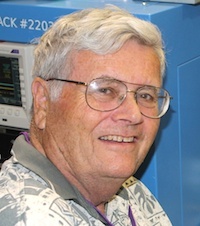 His early work at UCLA, in France, and in Davis, California, was in nuclear physics and astrophysics, but he soon began applying physical techniques to applied problems, especially air pollution. His data in 1973 on the impacts of airborne lead was instrumental in the adoption of the catalytic converter in California in 1976. He proposed and supported the law to lower sulfur in gasoline in 1977. He was director of both the Institute of Ecology and the Crocker Nuclear Laboratory, where his pioneering work included nondestructive analysis of ancient documents. He spent the following 20 years designing, building and running the aerosol network to protect visibility at U.S. national parks and monuments — now the national IMPROVE program. In 1994, he founded the UC Davis DELTA Group to investigate two areas of concern — aerosols and global climate change — for the National Science Foundation (NSF) and the National Oceanic and Atmospheric Administration (NOAA). Additionally his group analyzed aerosols and human health impacts for the California Air Resources Board, American Lung Association, and the Health Effects Task Force for Breathe California of Sacramento — Emigrant Trails. Because of this health-related work, a U.S. Department of Energy colleague asked Cahill and his team to evaluate air at the excavation project following the collapse of the World Trade Center towers in the autumn of 2001. Cahill was among the first to warn that workers at the site were at risk of serious health threats from the toxic metals in the air. While he is the author or co-author of hundreds of academic articles and book chapters, this is his first work of science fiction. Greenhouse Redemption of the Planet Kraal is available as a trade paperback through Amazon.com, Barnes and Noble and other online sellers. It also is available in digital (e-book) format for Amazon Kindle, Barnes & Noble Nook, Apple iPad and other electronic tablets. Available in the United States, Canada, the United Kingdom, Australia and other nations (at prices subject to exchange rate variations). Distributed by Ingram Book Co., the world's largest book wholesale distributor, as well as Baker & Taylor, and NACSCORP.